This management book authored by Bold New Directions co-founder Jim Hornickel, and edited by Suzanne Guthrie, is designed for managers and supervisors. 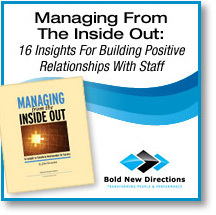 This unique management guide is full of 16 insights for “Managing from the Inside Out.” Deepen your knowledge, self-awareness and effectiveness by using these transformational methods to establish stronger & more effective relationships with staff. A thoughtful guide to creating productive relationships with staff, teams & peers.